The refills are double-sided and large enough to store 12" dies. Front magnetic face holds both dies and cling on stamps. 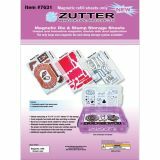 Zutter Magnetic Sheets 12.25"X8.5" - Zutter-Magnet Sheets. 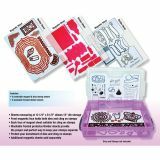 Store your die-cut and cling on stamps in this large size magnetic storage system! 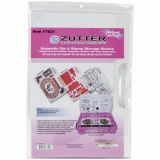 Fits perfectly in your Zutter magnetic die & stamp storage case. This package contains three 12-1/4x8-1/2 inch magnetic sheets and three 12-1/4x8 inch dividers. Imported.